Scaled down from 1024x768. Click for original. 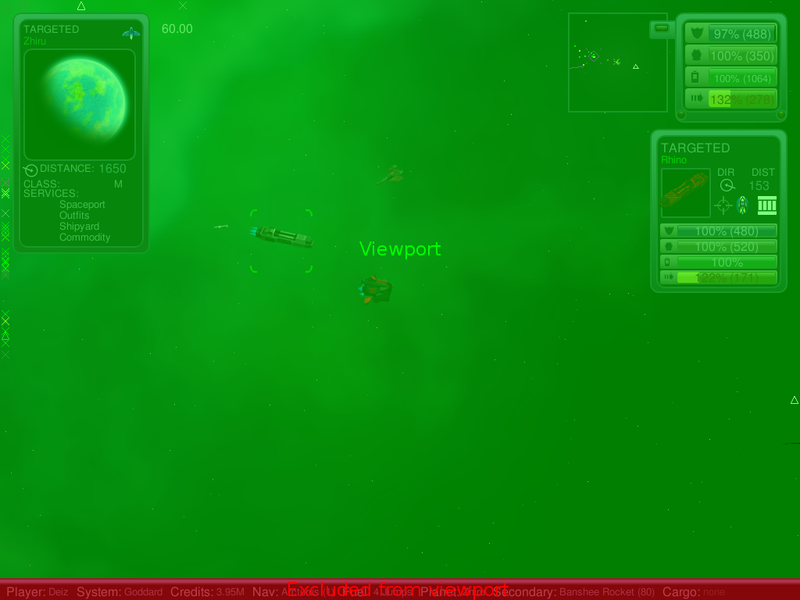 Most of the non-combat information has been shifted to the new bottom bar, and the view port has been made slightly smaller so that ships and off-screen indicators aren’t obscured by the bar. Since most systems in the post-bigsys galaxy have multiple planets, the planet pane shows the services that are available so that no guesswork is needed to find a certain service in a system with multiple inhabited planets. Moving over to the top-right, the player pane indicates shield, armour, energy and speed. Going clockwise from the top-left of the pane, the three indicator lights indicate a missile lock, autopilot and low armour, respectively. Below the player pane is the target pane. The distance and direction indicators, as should be obvious, are there to help the player strategically. The direction is the pilot’s heading, not the direction relative to the player (that can be determined with the radar and off-screen indicators). It’s useful as it allows you to approach enemies from behind. The three icons below indicate whether the target has targeted the player, their faction, and whether they have cargo. Keep in mind that lots of the target-pane information assumes full scanning. Once electronic warfare is finished, some information (such as cargo and energy, as well armour status if the shields are up) will be hidden unless you have an active scanner that defeats the enemy’s countermeasures. Once the weapons revamp is complete, there will also be a weapons pane for the player showing re-fire delays and heat (for bolt weapons that use ammo rather than energy). There will also potentially be a detailed scan view showing you an exhaustive list of outfits and cargo — Like the info window, but for your target’s ship. 9 comments to Behold, NAEV’s Lua GUI in full. This is looking really sharp. Does the gui allow you to limit the main display area to a certain resolution or part of the screen? I’m thinking of trying to use this to make a dual screen friendly ui that would require splitting the view of the ships and what not so that it takes up only half of the screen and then showing other information (missions, maps, etc) on the right hand side. This is looking great! I love the info panel at the bottom! @josephnexus Yes. The viewport function ( http://bobbens.dyndns.org/naev-lua/modules/gui.html#gui.viewport ) lets you do that. @qubodup Deiz made me do it. Although it is pretty cool. Either way, when the new weapon sets are in, the GUI will change a bit to show weapons, their cooldowns and their temperatures. (we’ll probably introduce weapon heat soon). Of course I’m getting ahead of myself mentioning that stuff :P.
@bobbens: Isn’t the viewport the entire usable area of the UI? Am I mistaken? The viewport is the area that ships and indicators are rendered within. It can be the size of the entire screen, but with the new GUI it’s not. I look forward to your response, I know it’s been two years since this post, but Id really like to talk to you.